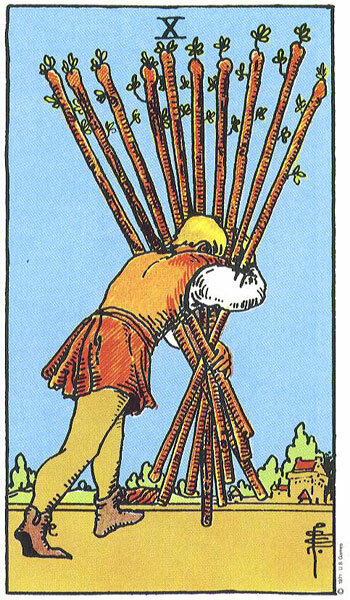 It’s a struggle to get anything done today (Ten of Wands) and traffic, in particular, is terrible (The Chariot reversed). Frustration mounts. There are delays and interruptions. And, naturally, on a day like this that is moving slower than usual anyway, there are always many errands that need to be done (more traffic!). 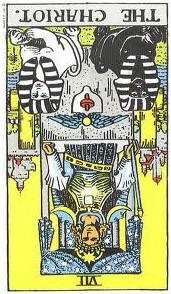 And someone (possibly children) keeps asking us questions that we don’t know the answer to (do you see the sphinxes on the front of The Chariot card?) Drive carefully, and stay cool, both emotionally and physically. Though it’s a struggle and a day of hard work, you are still moving forward and managing to carry your load, albeit slowly. Next Cards for the Day: If An Angel Appeared and Handed You an Idea, Would You Notice? No, not literally! 🙂 Just my focus and will to get anything done. I just kind of felt turned upside down all day yesterday. Well, that’s a relief! I hope today was better.